In full disclosure, my kids are teenagers! 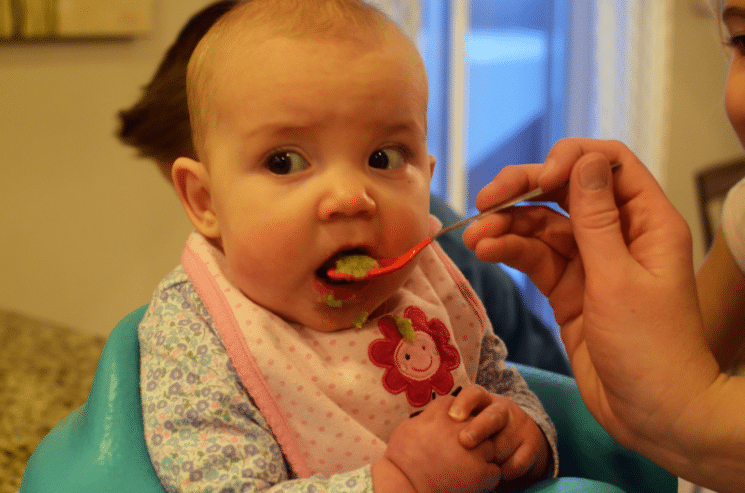 I had to borrow the adorable baby in this post to taste test our veggies today. I would totally keep her if her mother let me! But maybe it’s a good thing, because I can tell you how I fed my babies in retrospect. Just about every food my babies ate were first a pureed version, then a softened version of what the rest of the family was eating. I don’t remember purchasing much in the way of prepackaged baby food. Maybe because I’m sort of a cheapskate and couldn’t stomach being charged $1 for a teeny tiny jar of sweet potatoes, and maybe because it just seemed more practical. 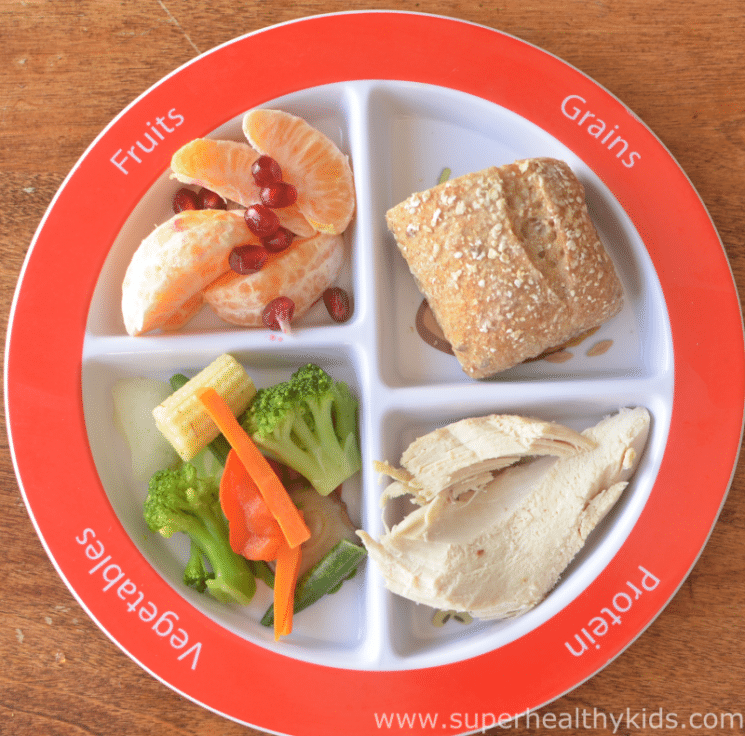 We teach at Super Healthy Kids that children need to be exposed to a variety of foods, in a variety of ways, textures, and even temperatures. This prepares them to be more accepting of new foods later on. 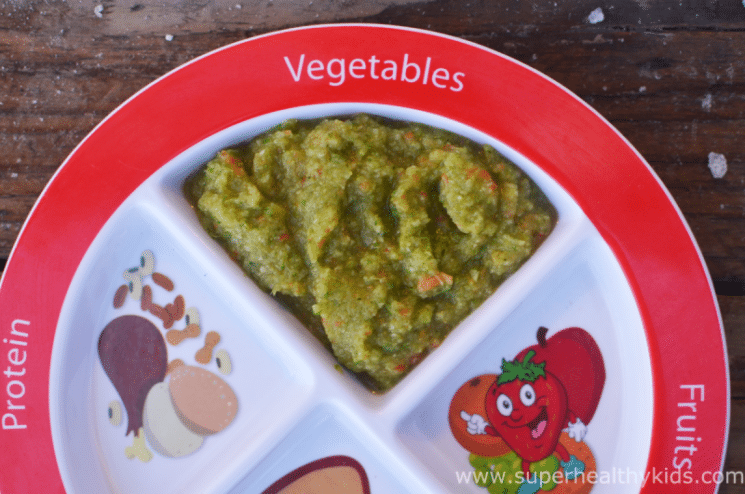 It’s not so important that kids learn to love greens, but they can start with pureed green beans, then move on to softened broccoli, then they try cooked Brussels sprouts, and then raw veggies! It’s a progression, and each step along the way they are developing taste buds to appreciate each flavor and taste. 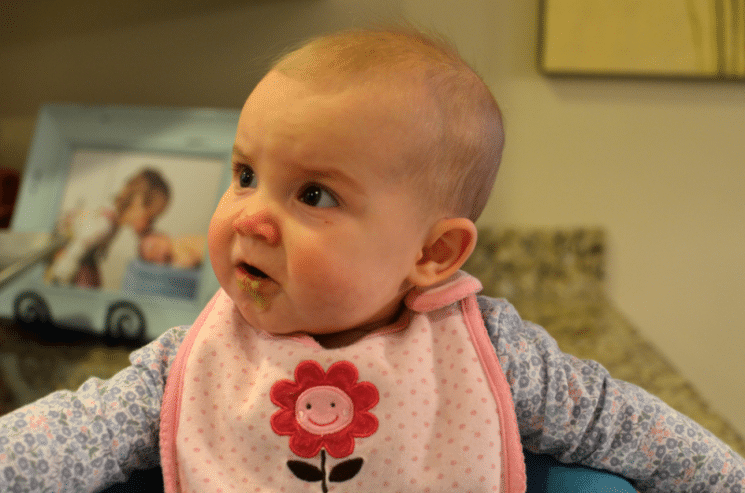 One big reason I think that more parents don’t make their own baby food is the hassle factor. It’s like cooking freezer meals once a week or month. Who has a whole day to cook? When we think of making baby food, I think we imagine this large, messy and time consuming process. But it doesn’t have to be. As long as you (and the rest of the family) are eating enough fruits and veggies, you can also feed this to your babies. So with that in mind, here was the family meal. We had a rotisserie chicken, steamed veggies (from a mixed frozen bag of stir fry veggies), a whole wheat rolls, and some fruit salad. The process is simple. 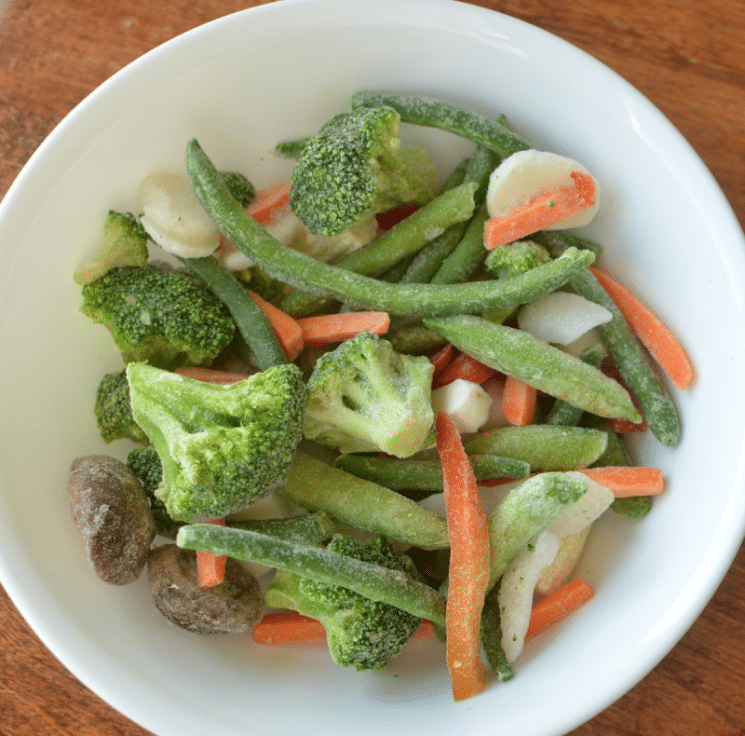 For my kids, I started with a bag of mixed veggies. I put the veggies in the steamer, for about 7 minutes- this was the most time consuming part of the whole meal! The entire dinner was under 10 minutes, because I had brought a Rotisserie chicken home from the grocery store. While the veggies were steaming, I peeled the oranges and de-seeded the pomegranate for the fruit salad. Once steamed, I kept 1/2 cup out for the baby, and served the rest to the family. For the baby, I have a very small food processor that I purchased years ago for $40 at Costco. It’s perfect for these little jobs. 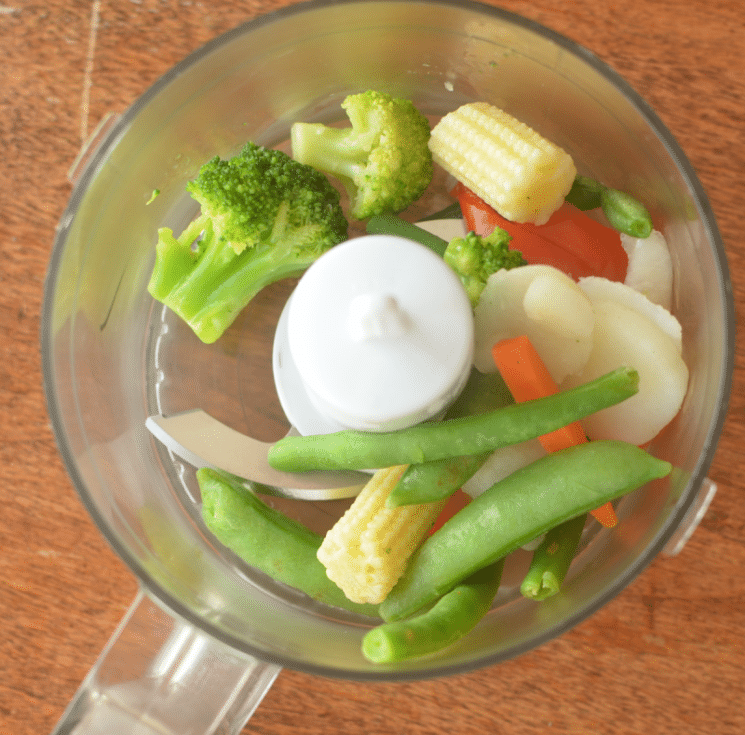 I used 1/2 cup of of veggies, and 1-2 Tablespoons of water, and pulsed until it was as smooth as I could get it. Then, we all could eat! 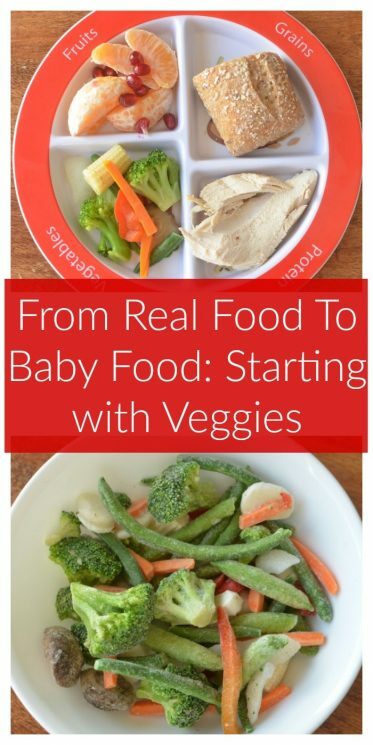 As long as you are fixing vegetables for yourself, make some for your baby too! 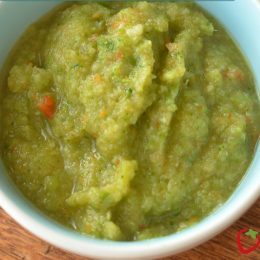 Of course, this cute baby didn’t eat ALL of the veggies we made, but you can use cleaned out baby food jars and return the uneaten portion to your fridge for lunch the next day! Even babies can eat leftovers. 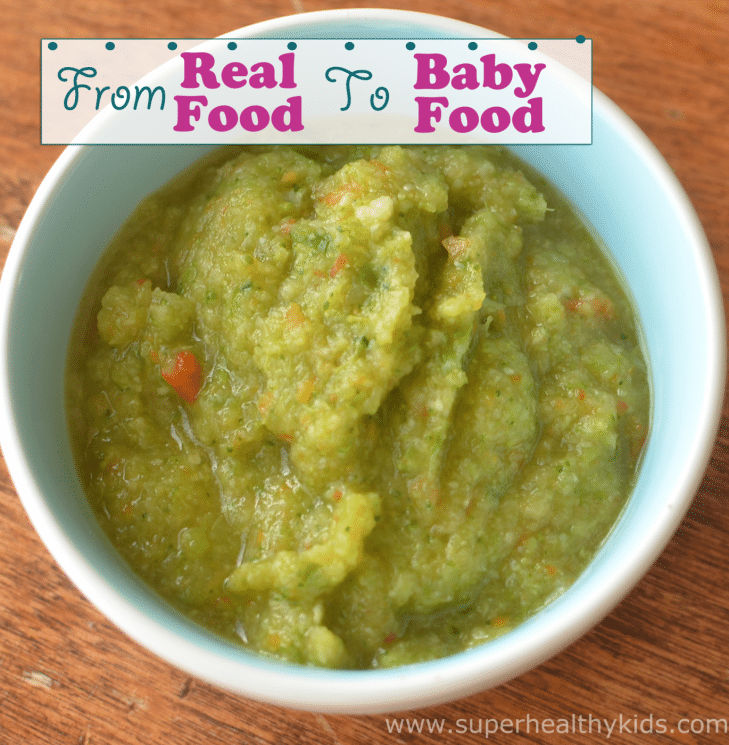 For more baby food ideas, check out the baby food category! 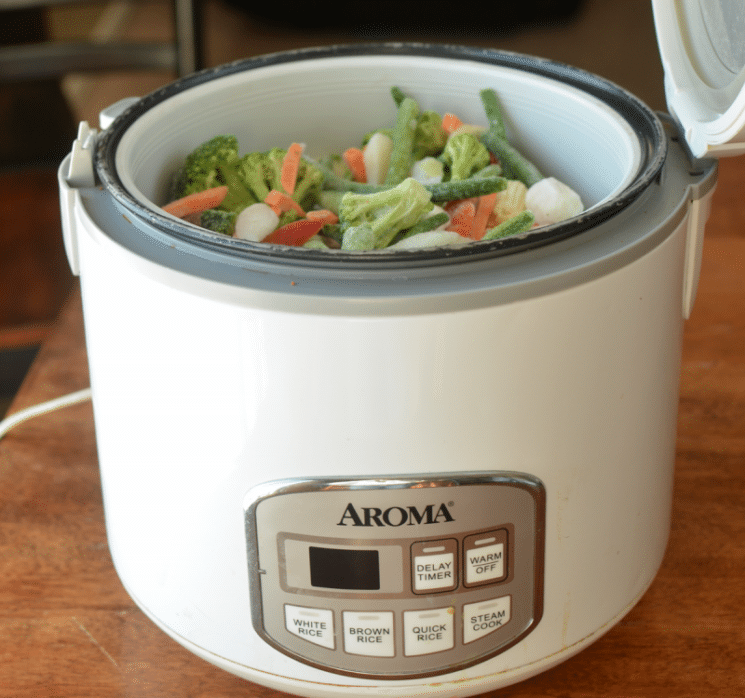 Place frozen vegetables in a steamer for about 7 minutes. Remove from steamer and add to food processor with 1-2 tablespoons of water. Pulse until smooth.